Sweden has become the 24th of the EU's 27 member states to ratify the controversial Lisbon Treaty. 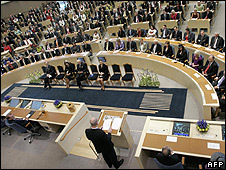 Sweden's parliament backed the reform treaty after a late-night debate, with 243 votes in favour, 39 against and 67 deputies absent or abstaining. The treaty, aimed at reshaping EU institutions to fit an enlarged bloc of 27, has to be ratified by each member state to take effect. But Irish voters rejected it and Czech and Polish ratification is stalled. The Republic of Ireland's "No" vote in a referendum in June threw the whole ratification process into disarray. Governments in countries that have ratified the treaty insist it cannot be changed, so treaty supporters are considering whether some guarantees can be offered to placate Irish voters. The Irish government is expected to present a plan for breaking the impasse at a summit of EU leaders next month. There is speculation that another referendum may be held in Ireland. The treaty was originally meant to be in place in January 2009 - well ahead of the European Parliament elections in June 2009. Critics see the treaty as further evidence of a federalist, pro-integration agenda at work in the EU. They say the treaty is just a modified version of the EU constitution, rejected by French and Dutch voters in 2005. Even some of the architects of the defunct constitution say that the Lisbon Treaty is very similar to it. One of them, Labour MP Gisela Stuart, says the Lisbon Treaty "is to all intents and purposes the old EU constitution under a different name".